Conventional theory places the origins of planets and satellites in a single event billions of years ago. 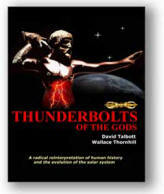 The Electric Universe provides a unique birthday and subsequent history for each one. Cassini, the spacecraft now orbiting among the moons and rings of Saturn, snapped this close-up shot of Hyperion, one of the small moons. According to the currently accepted theory, the crater-saturated surface formed 4 billion years ago. A cloud of gas and dust slowly collapsed under its own gravity, and the Sun, planets and moons gradually condensed out of it. But shortly after forming, the larger bodies began to sweep up the smaller “left over” pieces. Collisions, from large and spectacular to small and trifling, covered the surviving bodies with impact craters. 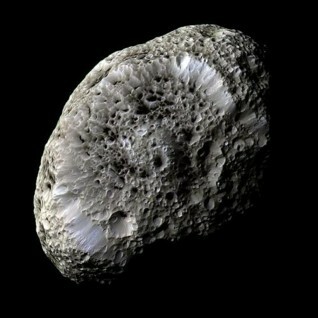 On bodies such as Hyperion with little or no atmosphere to erode the craters, they remained pristine until today. Hyperion’s biography consists of a slap on the bottom at birth followed by a protracted era of monotony. 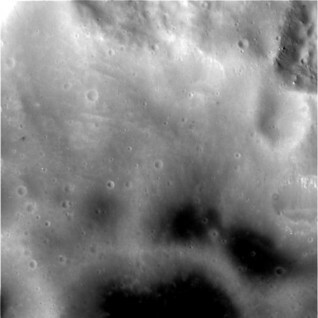 According to the Electric Universe, Hyperion’s crater-saturated surface formed in several episodes. Saturn was—and still is—an electrode in a cosmic electrical discharge that can vary greatly in power. Positively charged material collects at Saturn’s core. When the discharge becomes too powerful, the material at the core is ejected. As it passes through layers that are less positively charged, it becomes the target for arcs, which leave craters where they strike. If the ejection is not energetic enough to expel the material from Saturn’s gravitational sphere of influence, the material will orbit Saturn and become a new moon. It will likely disturb the orbits of any previous moons, and, because it is still more positively charged than they are, close encounters will result in more arcing as well as in changing orbits to produce a “least interaction” configuration. This arcing transfers electrons to the newcomer and begins to equalize its charge with its new surroundings. Subsequent episodes of ejection produce new bodies, which in turn disturb the orbits of the existing ones. The older moons may experience many episodes of cratering. Hyperion’s electrical biography consists of a shock at birth followed by other shocks at the births of siblings.